Currently we offer 4 different edge profile choices, Round over which is the most popular followed by the Radius edge, Square and Cove. If you plan on your product to touch up against a wall or trim section, we can make the ends square just let us know what you want. What is the most popular edge profile? By far the most requested edge profile is the Round Over. 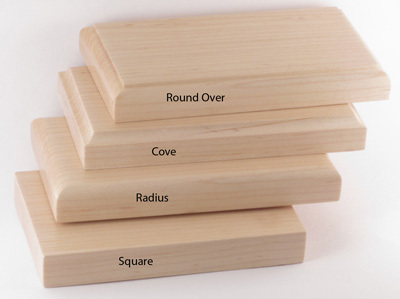 The other three choices Cove, Radius and Square are about even in terms of their popularity. Form time to time we receive requests for a custom edge profile, many times we can accommodate these requests. If you are looking for a particular edge profile let us know if we have the cutter available we will be happy to make a custom piece for you.